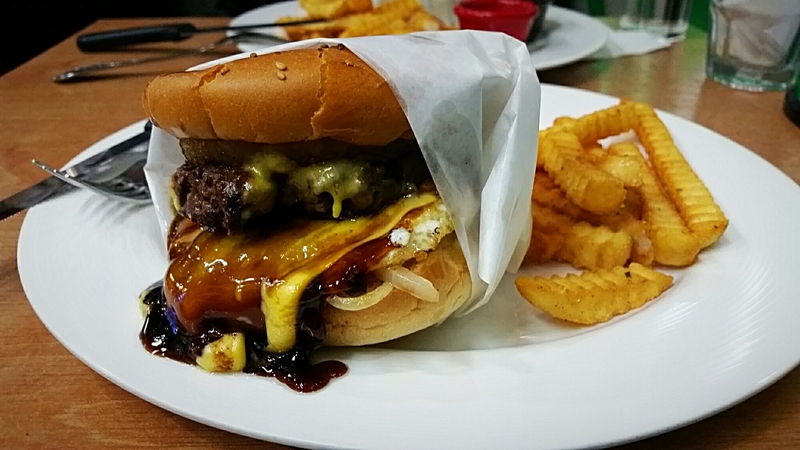 hamburger | A Foodie's Pursuit! ~ Pursuing food like a foodie should! Posted by afoodiespursuit in Food from my travels, Good Eats! I always need access to a good burger place wherever I go. What can I say, it’s the American in me. I’m in Daejeon South Korea and there is a place that claims to have “the best burgers in Daejeon.” That’s a pretty bold statement. So I took a trip to House Grill to find out for myself! 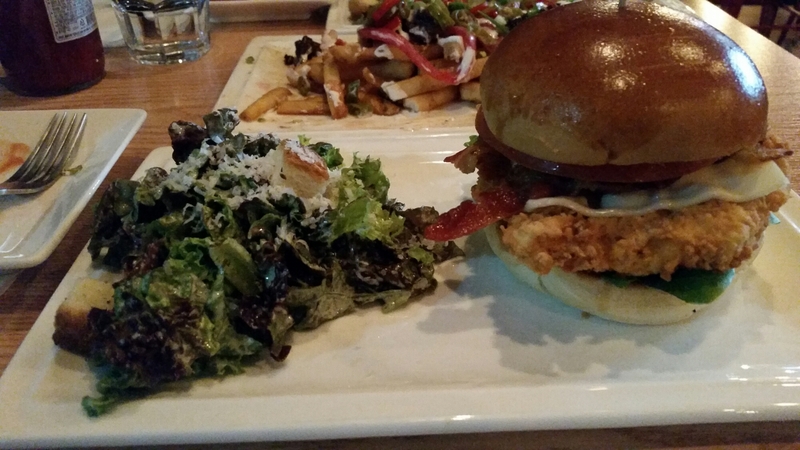 With so many burgers to choose from, I chose the burger with the chef’s name: Brian’s Burger ₩10,000. 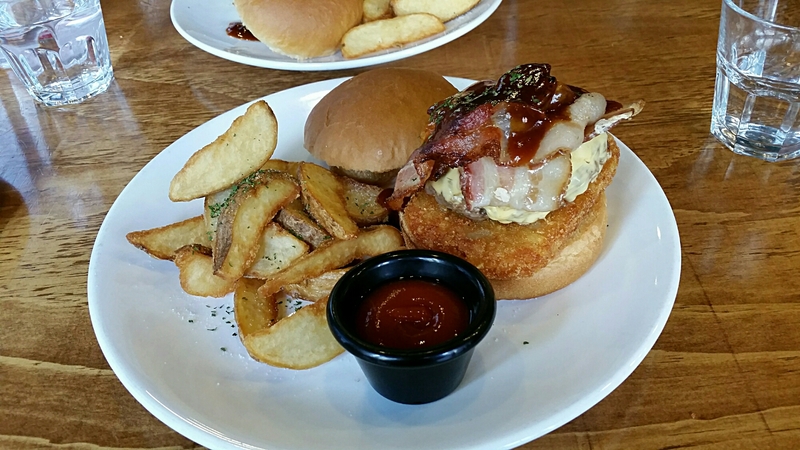 It was topped with an egg, a slice of pineapple, grilled onions, cheese and teriyaki sauce. Pretty good burger! 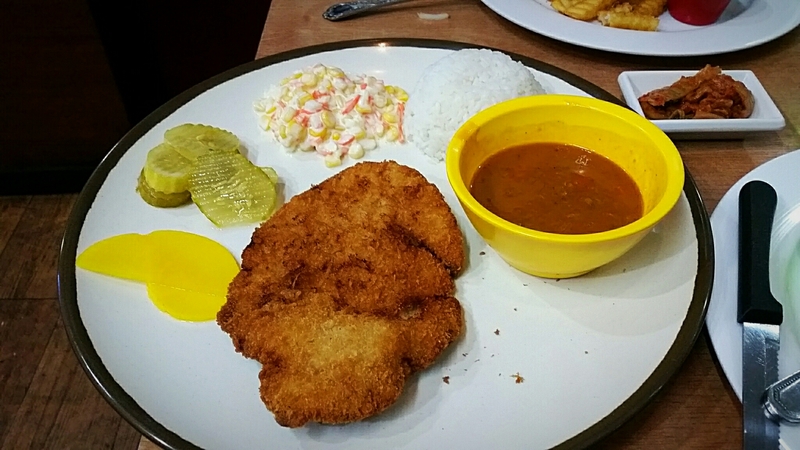 I was really hungry that day so I also bought a pork cutlet (donkatsu 돈까수) ₩7,000. I liked the soup that came with it too (I think it was curry but my friend thinks it’s chili). It was my last night in Hong Kong and I went to see the Chinese New Year fireworks on Victoria Bay. After the fireworks, I was hungry and wanted some food to eat. 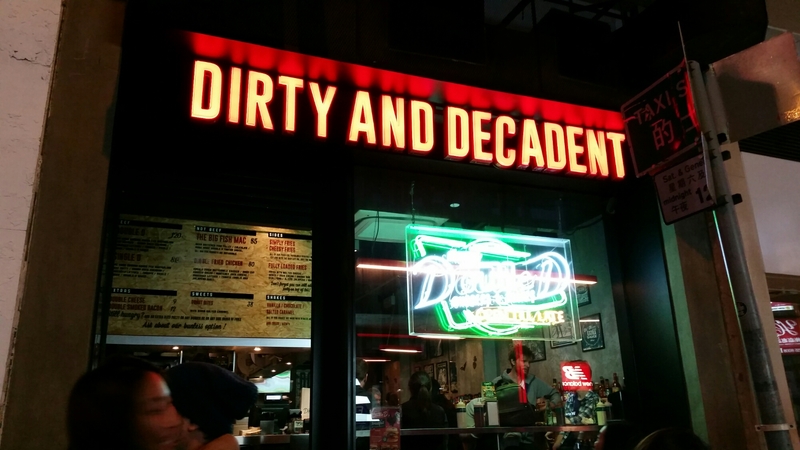 After walking for 15 minutes away from the crowd, I ended up at Dirty and Decadent (Double D) which is a 2 minute walk from central station (I forget which exit). 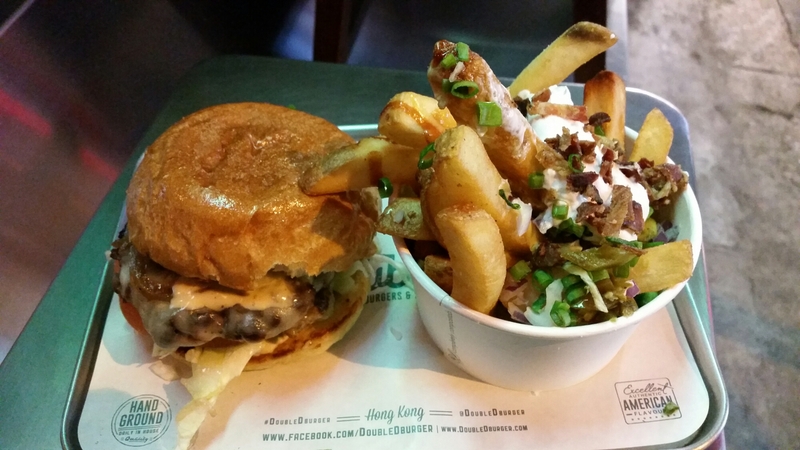 I ordered the Loaded Fries ($53hkd) and their Single D burger ($80hkd) because they were out of the chicken burger. They had a deal going on. After 9pm, it’s buy 1 burger get one free. I’m not a big eater so I ate as much as I could of the second burger (about half). 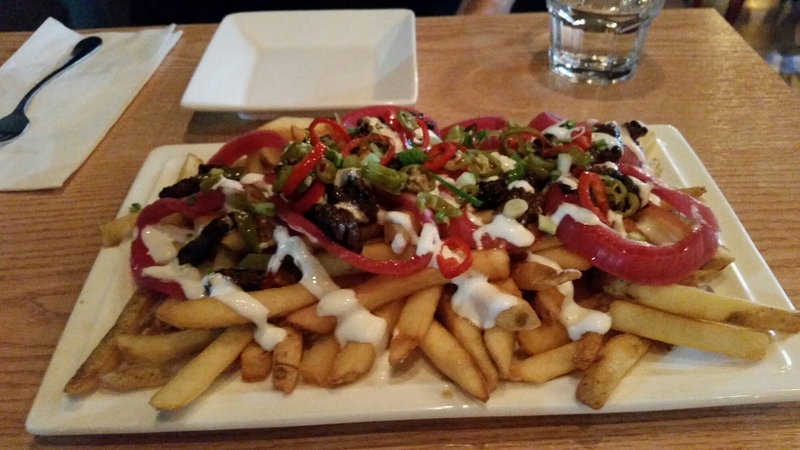 I loved the loaded fries with cheddar cheese, jalapeños, green onions, bacon and topped with sour cream. The burger tasted good too. For a late night meal after the fireworks, this place was great. I was satisfied! A friend took me to Flapjack Pantry in Pangyo (a city in Seongnam South Korea). The Pangyo area is known for its foreign restaurants. Most shops are still under construction in certain areas but most of the city has a European feel to it. 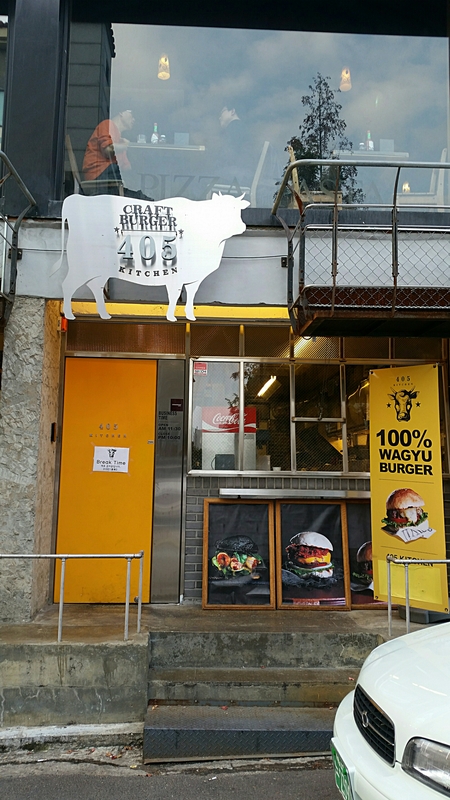 I had read a blog post about 405 Kitchen in Gangnam, South Korea. 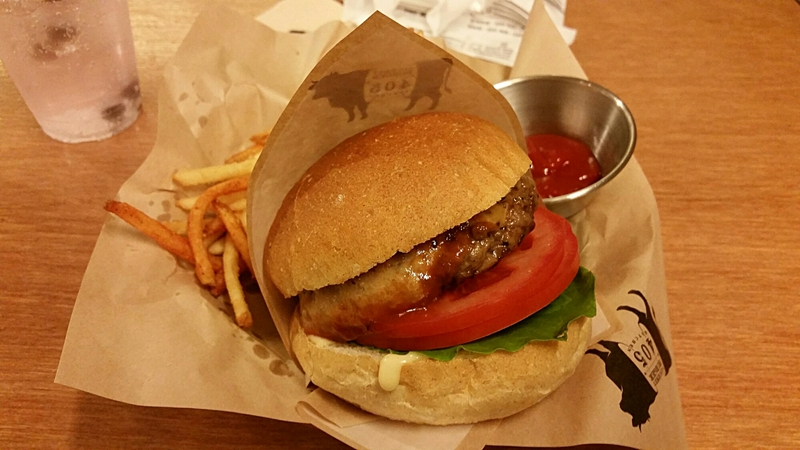 They make the famous japanese cow (wagyu) beef hamburgers (which is like kobe beef, my favorite). This place was very easy to find. Exit 11 at gangnam station, walk straight to CGV, make a right and walk up the hill until you see Brick oven Pizza. They close between 3pm-5pm.